Last month when my daughter and I were wrapping a birthday gift to bring to her friend’s party, the result was sort of underwhelming – especially for a 5 year old! “Mom, that gift looks kind of small” was her reaction once we had finished wrapping up the lovely little present we had bought. 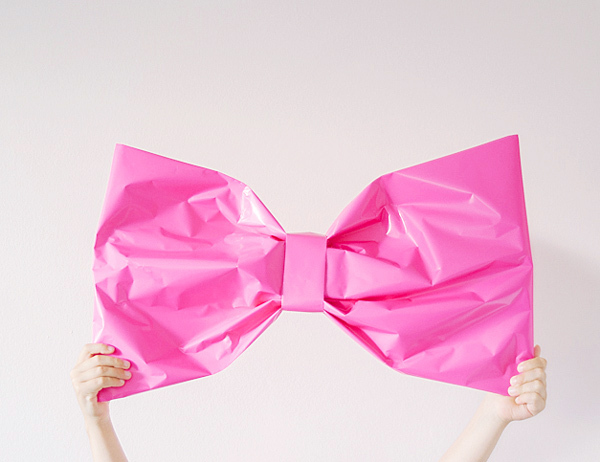 So, I thought “let’s make it bigger!” and came up with this easy giant bow gift wrap. All you need is a little more gift wrapping paper and you can make a big impression with an ittybitty gift! Step 1: Grab your materials and a little gift. The one i used is the size of a deck of cards. 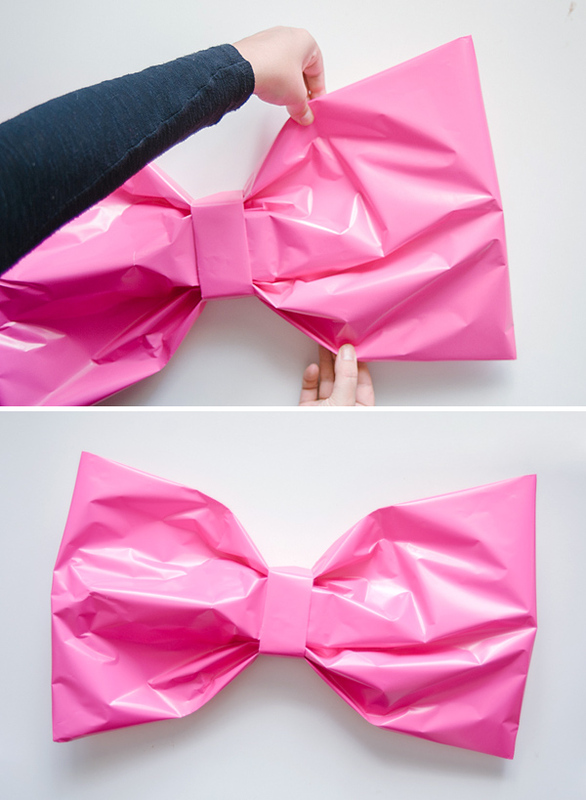 Step 2: Cut a large piece of wrapping paper, a little longer than you want your ready bow to be wide. Place your gift right in the middle. If you want, you can fix it with a little double-sided tape. This will make the wrapping process easier. Step 3: Start wrapping by folding over one side of the wrapping paper right up to the middle of the gift. Step 4: Fold the other side in the same way and fix with transparent tape. Step 5: Now fold and fix the sides of the gift just as you would with regular wrapping. Step 6: You should end up with a large rectangle wrapping that carries your little gift right in the middle. Step 7: Prepare a strip of paper about 3-5 inches wide and fold it 3 times length-wise. This will be the center of your bow. 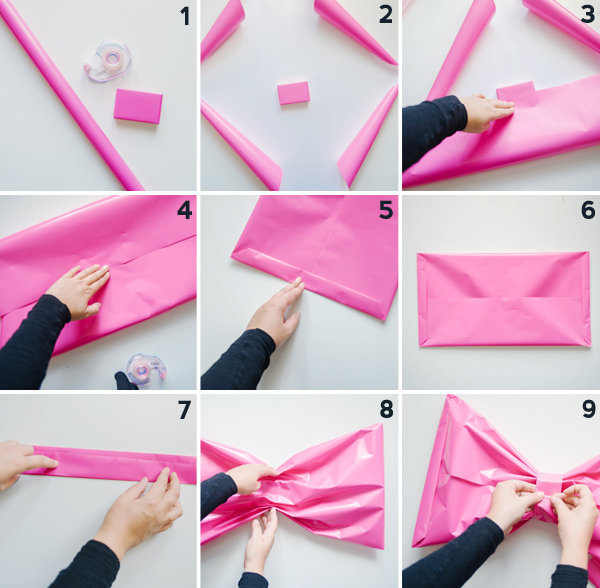 Step 8: Now grab your wrapped gift and carefully push in the sides towards the center creating the bow shape. Step 9: Flip it over, then wrap the prepared center strip around and fix it with tape in the back. Now you’re done! If you want, you can carefully (!) 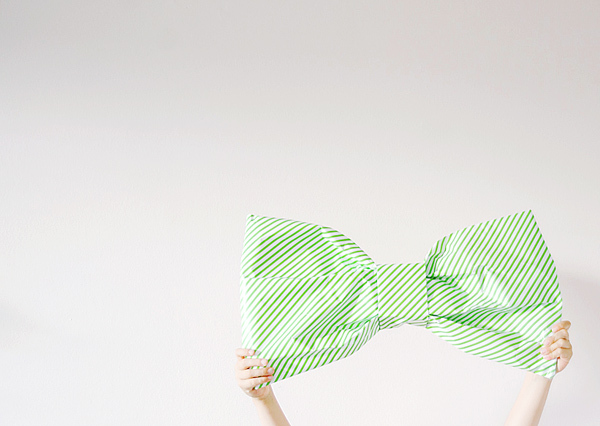 pull apart the wrapping paper to open up the bow a little more. At my first attempt, I was doing this in a rush, so I tore up the paper. Needless to say, my daughter LOVED these. So much that she almost didn’t want to give them to her friend. Wow! it’s a nice idea, I always say that sometimes presents are so beautifully enveloped that its a pity unwrapp them… this is just the case! Ooh they are so cute!!! I love them!! Super cute, this would be so cute in a little girls room. I know its for wrapping, but its too cute! Love this! Would be so cute with multiples hanging on the wall for a Kate Spade inspired bow party! So adorable! Going to try for an upcoming baby shower this weekend! So many sweet possibilities for present decorating with these bows. At this point, anything wrapped not in a giant bow is a waste of time. So cute!! Can’t wait to make these. I’m more of a visual person so it would be lovely if you could make a video tutorial for these. I can’t seem to figure it out. Thanks!